In this episode of Points North, Shawn talks about his first day grouse hunting this year. 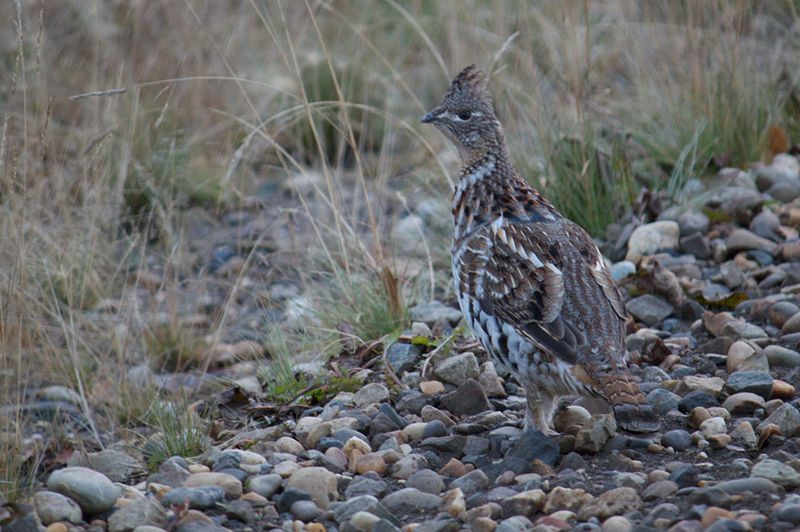 Early grouse hunting ought to be easy, but it never is for me. With a strong desire to see birds, not people, I generally go off the beaten path—or any path at all. With a dog in the lead and a shotgun in hand, into the leafy jungle I go. On opening day, I headed for familiar ground—a sweep of state forest not far from the Canadian border. The cover runs along the north bank of a swampy headwater tributary to the Pigeon River. Most of the area was logged at one time or another during the past 40 years, creating a mix of young aspen and balsam forest intermixed with tag alder lowlands and remnant stands of mature woods. Over the years, I’ve flushed countless grouse from the thickets, jumped mallards from beaver ponds and collected quite a few moose antlers there. There is no path through this place other than my own. I bushwhack through the thickets, follow overgrown logging roads, and prowl along moose trails. Usually it takes about two hours to circle through the cover and return to the truck. While I’ve made this walk many times, it had been at least a couple of years since my last ramble through the brambles—mostly because I have less reason to do so. Once infested with moose, the cover now supports mostly deer, so it is no longer a good place to find moose antlers. Beavers are absent from the ponds, which have nearly dried up, so mallards go elsewhere. In the forest, the only constant is change. Brush overtakes the openings, windstorms topple trees and young forests grow with surprising vigor. I didn’t walk far before realizing this familiar place now looked different. While I knew where I was, the forest wasn’t immediately recognizable. One difference was the lack of moose trails, which once crisscrossed the area like muddy sidewalks. The brush formerly pruned by browsing moose now exploded in riotous growth, adding some extra “whack” to my bushwhacking. If you spend enough time in the woods, you learn to recognize places as well as you would along a familiar city street. A copse of balsams, a deadfall, a rotten stump or an individual tree can be like a street sign or a house address that tells you where you are. Using these natural landmarks and the pitch and roll of the terrain as your guide, you can hike through trackless forests and know where you are. So even though the woods looked different to me, I was able to follow my old, and now indiscernible, path for a half-mile through the woods. Then, wonder of wonders, I stepped out on a fresh ATV trail. It went my way, so I followed the trail and wasn’t surprised to discover it led to someone’s bear-hunting bait. The ATV trail ended there, so I followed a path made by bears visiting the bait to reach the first of three beaver ponds. In the past, when aspen saplings were sprouting on the adjacent hillside following a logging harvest, the pond had an active beaver lodge—fueled by the aspen food supply. Back then, the pond was a place I could count on to see both moose and mallards. Eventually, the beavers cut down and ate the aspens near the pond. Balsams, not a preferred beaver food, grew in their stead. The beavers went elsewhere, as did the moose and mallards, while the pond dwindled to a puddle. Such change is inevitable and is part of an endless cycle of beaver habitation along northwoods waterways. I still found a few moose tracks in the mud as I followed a faint logging trail to the second pond, which held even less water than the first. Pausing there for a moment, I thought about past frosty mornings when mallards erupted from the water when I stepped through the alders. You can have better duck hunting just about anywhere else, but I like northwoods beaver pond mallards the best. Crossing a low ridge, I became a little confused on my way to the third pond, once an easy hike along a worn moose trail. This time, I added a couple of hundred yards to a walk which shouldn’t have totaled much more than that. Again I arrived at a pond that was nearly dry. I remembered watching a good bull moose walk across the blowdown-strewn ridge across the pond, just a few days after a successful moose hunt with my father. That was in 2000 and we’d seen four separate bulls in just two days of hunting. You could hunt the entire season here now and be hard-pressed to encounter four bulls. At the third pond I swung away from the water, following a former logging road that was now just a brushy game trail. The dog and I took a short break in a stand of young jackpines. Known as a fire-dependent species, many North Shore jackpine stands were harvested when I was a kid and grew back either as aspen or were planted with red pine. This patch, no more than a couple of acres in size, was a memory of a now-forgotten forest. On the other side of the jackpines was a logging trail left from the most recent operation seven or eight years ago. It led roughly in the direction of the truck, so I followed it, marveling at how rapidly the regenerating aspen and balsam had regrown. Within a few hundred yards this trail led me to the ATV trail, which I now followed in the opposite direction out to a rough, but passable forest road. From there I walked back to the truck. The dog and I were tired but happy when we reached the parked pickup. Our two-hour stroll was a great start to the hunting season. And as for birds? Well, we managed to get the only one we flushed, which was less than I expected, but better than none at all.